gentle – quiet – sincere – loving – loyal – godly – giver – humble – lover – friend – strong – wry – phlegmatic – finisher – husband – father – daddy – grandpa – poppa – pastor – shepherd – worshiper – genuine – instructor – actor – painter – artist – novelist – listener – tidy (except for the garage) – peacemaker – son – brother – uncle – dad – teachable – reachable – loveable – loved – insightful – peaceful – funny – tender – craftsman – creative – thoughtful – shepherd – watchful – teacher – mine. Pictured: from the family party we had early (we’re out of town right now, when we get home, a bunch of the fam will be out of town – so we had it 8 days ahead of schedule!). Stormie and Elise provided pies at the birthday boy’s request. 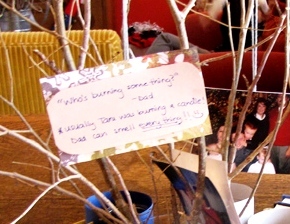 Steph headed up decor: quotes about writing and books and from his favorite authors (Tara included actual quotes from Dave like, “Who is burning something?” which was usually Tara burning candles in her room. 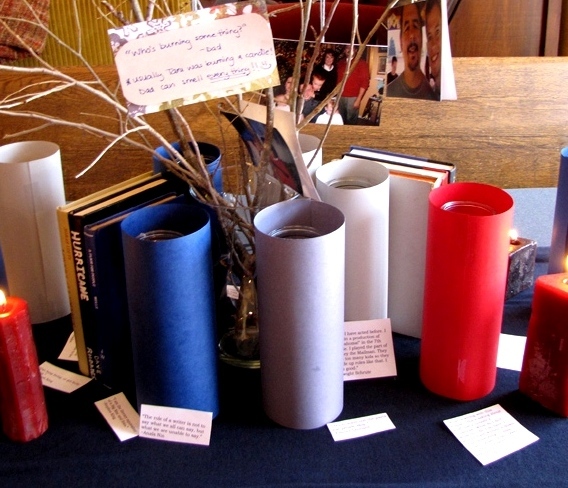 And “Jiggle the handle.”); candles and books, tree branches on which to hang photos of family and the kids with their dad. 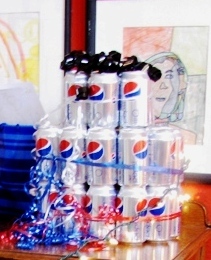 The kids gave him things like: 50 cans of Diet Pepsi, $50 to Auto Zone, 50 Little Debbies, etc. Tara got a Mexican meal together. The boys arranged a laser tag event. We ate. We sang. We enjoyed pie. We did presents. We played Movie Charades because Dave loves movies! Then we had a fire on the patio and roasted marshmallows. We got to do all of this because David Allen Rhoades was born. 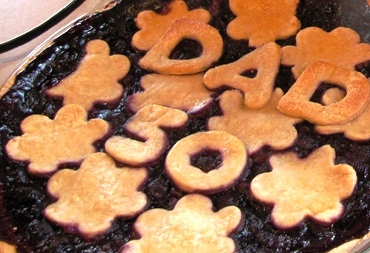 Happy happy birthday to Dad! And just to clarify – ‘Jiggle the handle’ was my quote for Dad. I can remember him saying that many times at the Acoma St. house! Happy Early Birthday, dad! You’re the best dad ever!! – Sometimes simple is the only way to put it.